“What?” My husband said in disbelief. “It’s true!” Lauren said. “At least, my mom says so. They make a noise like this. ‘Shhhooo, shhooo, shhooo.’” She demonstrated this sound while making a motion that looks a little like the breast stroke. We may have had some tropical drinks earlier that day. Anyway, we went to bed, and the next morning I awoke to a tapping sound. I assumed it was my husband puttering around. The tapping continued, and since there aren’t too many activities Steve can do in the morning that involve tapping, I pulled off my sleep mask (yes, I use one; they’re awesome, look into one) to see what was up. I ran and grabbed Steve to make sure someone else could witness this. We watched the crab scuttle around for a little while until he sidestepped away, presumably off to make someone&apos;s 9:15 wakeup call. It was an amazing way to start the day. I have never been woken up by a sea creature tapping at my window before, especially not when I’m not staying in a house on top of a hill away from the ocean, and definitely not the morning after we were discussing his kind. Naturally, everyone was amazed (and a little jealous) of my amazing story. Crab-tapping-at-my-window will probably go down in my personal life as the strangest way I’ve ever been woken up. Funny enough, this replaces the next-strangest-way I’ve ever been awakened, and that time also had to do with sea life: In college, my friend Brooke moved a 30-gallon fish tank into our dorm. She placed a hose in the tank to fill it, a process that would take several hours, and we went to bed. Around 3 a.m. she shook me awake in a panic, saying, "CLAIRE, WAKE UP, WAKE UP, GET UP GET UP NOW." Naturally, I thought the apartment was on fire and we were all going to die, so I was fairly relieved to find that all that had happened was that several dozen gallons of water had been misdirected onto the floor. The apartment smelled bad for the rest of the year. But at least I hadn’t died in a fire. Anyway. 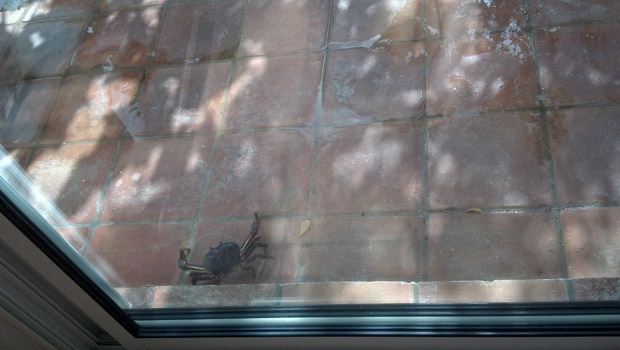 Crab trumps fishtank-related panic. But can you top the crab? What’s the strangest way you’ve ever been woken up?